Sevastopol citizens were offended by Russian government for being lied to. 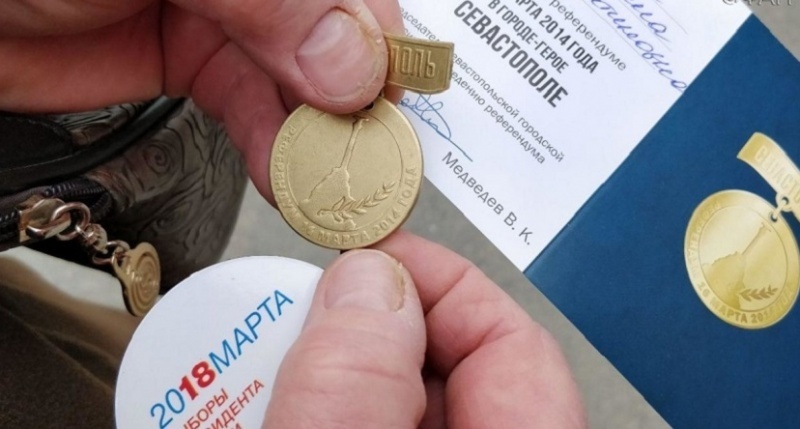 It concerns a scandal around the shortage of medals «Forever with Russia» promised to those citizens of Crimean Sevastopol who would come to give their vote during Russian elections on March 18 this year. Just the day before the elections former head of local CEC Valery Medvedev had promised that all Sevastopol citizens coming to the presidential elections would receive a medal named «Forever with Russia». However, on the election morning it became clear that there were not enough medals for everyone. The official version said that that was because of the storm on the Kerch Strait ferry line. The situation looks ridiculous. Nevertheless, local social media burst into irate comments. Angry Sevastopol people vilified local authorities, the CEC, the TEC and the workers of polling stations. They even refused to vote if they did not get the reward. The situation looks like a molehill turned into a mountain, but people were really dissatisfied. They complained: «I went to the referendum, but they gave me nothing» or «The child cries, he wanted a medal». In fact, people are jarred not because of failing to get medals. They were angry for being deceived on such trifles. That`s why attempts to remedy situation will be vain endeavours. Thus, the elections passed but an unpleasant sediment remained.